I picked up John from Seoul Station on Friday after work, and we headed back to my town right away (on the 2.5 hr bus ride...). Here's how we spent the rest of the weekend. I still felt quite crummy on Saturday, but John and I went into Seoul and soon met up with my friend Abby. 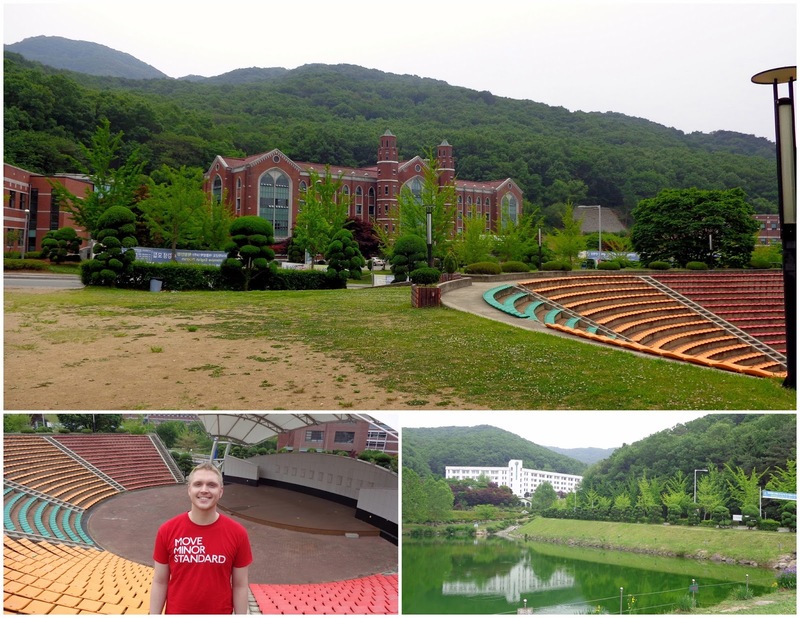 We spent the afternoon walking through the City Hall / Jonggak area, which happened to be bustling with activity. First John and I walked around the Cheonggyecheon Stream, which is really nicely done in this area (the stream and paths lie below street level). 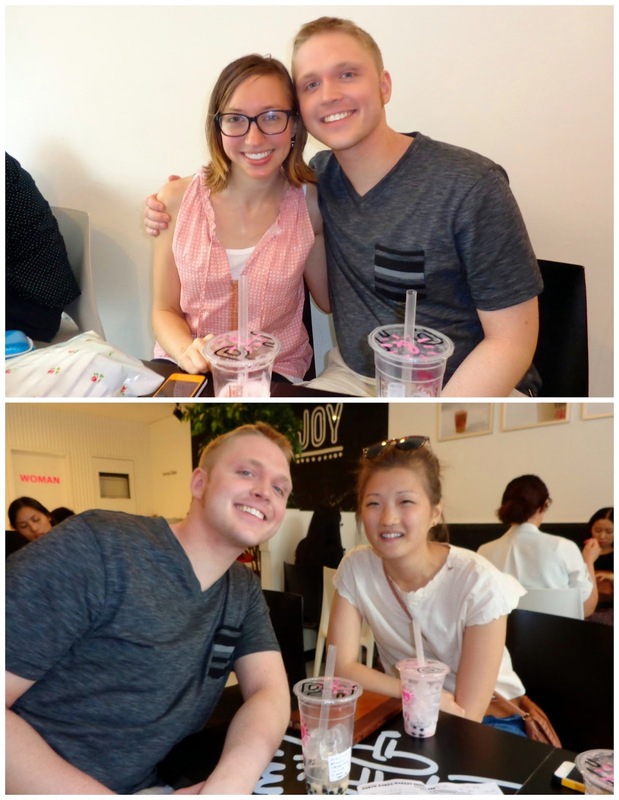 When we met up with Abby, we went and got some bubble tea nearby. And then we kept running into event after event in the area! 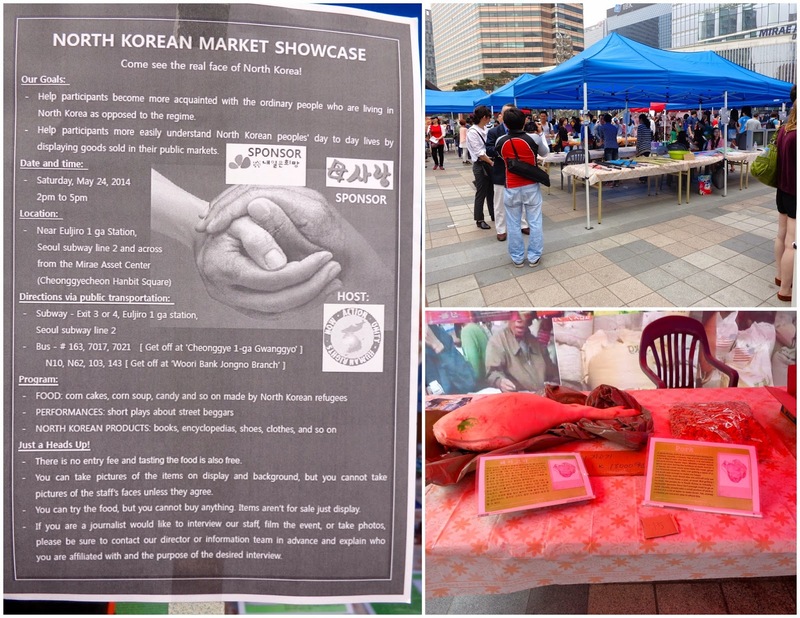 First it was a North Korean Market Showcase, taking place that afternoon from 2 - 5. Nothing was for sale at the market, since the event's purpose was to educate people about what it's like to live in North Korea. The items on display at the market had signs (in English and Korean) explaining how much the item would cost in North Korea, and sometimes included a short story related to the item, told by a North Korean. The mood definitely slowed and lowered when going through the market, but I'm so glad we got to walk through and learn some more about North Korea today. 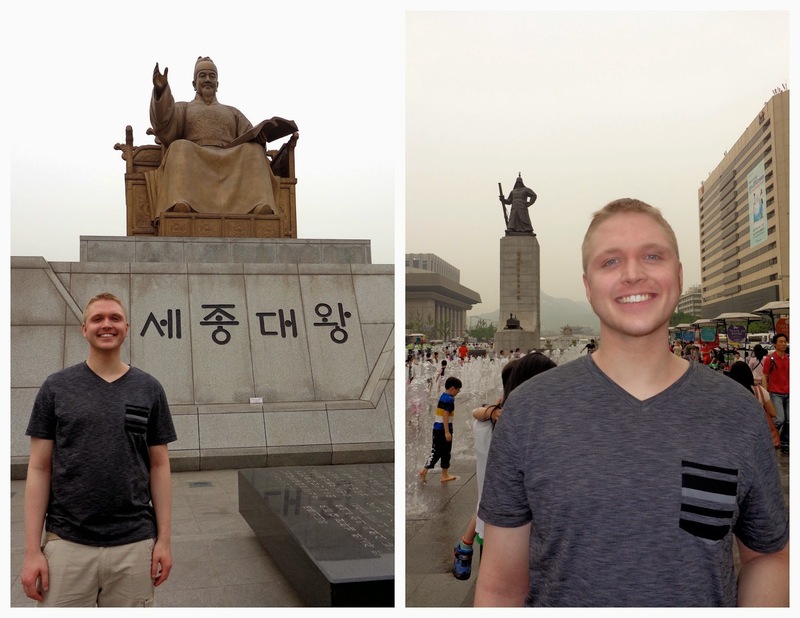 Then we walked to the King Sejong statue, where John took some obligatory tourist photos. 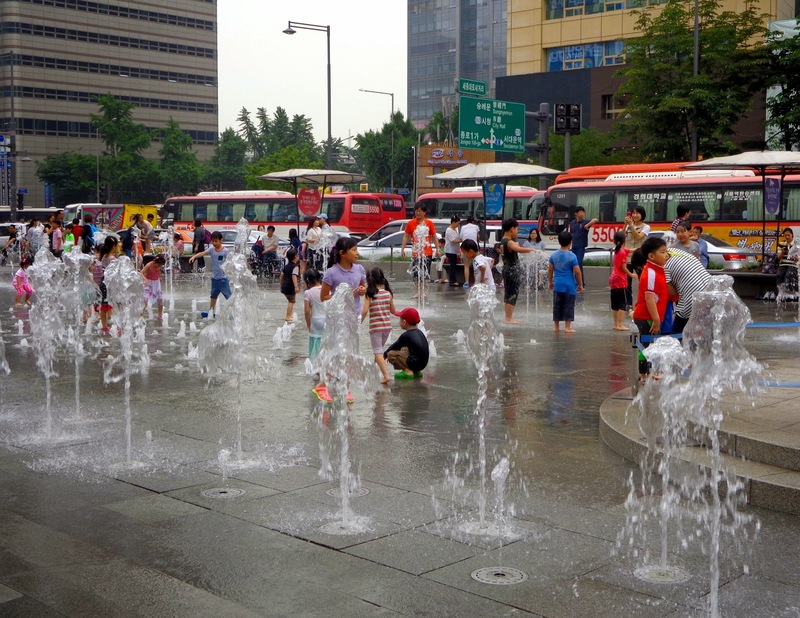 Kids were running through the nearby fountains to cool down, with so much glee on their faces. Right next to the King Sejong statue was a tent with some calligraphy going on. We inched towards it curiously, and soon found out from a helpful volunteer student that we could have Korean calligraphy done for free. There were books with hundreds of proverbs to choose from, or you could make up your own saying (if you could write it in Korean). The three of us each chose a saying, filled out a small slip of paper, and then stepped in line. 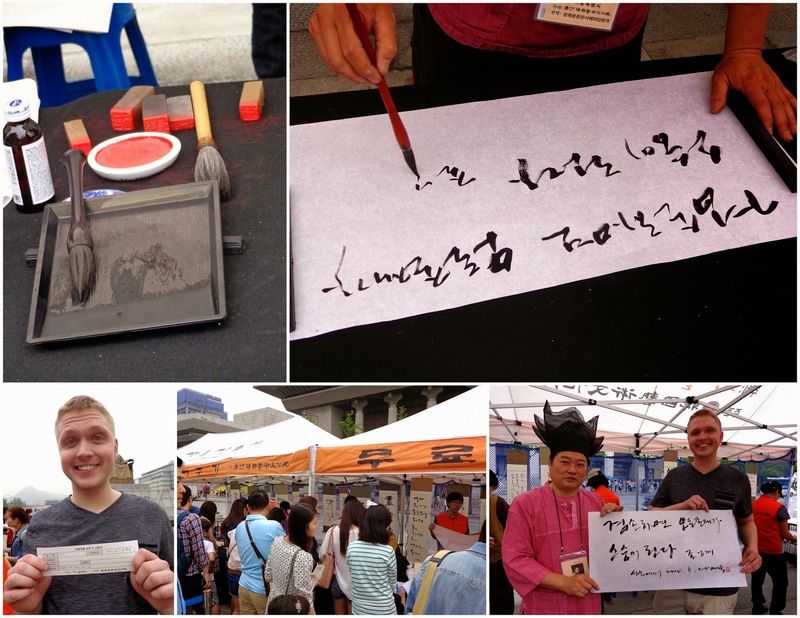 The calligrapher wrote our name, date, and place (Seoul) at the bottom of our quote. It was a neat cultural event, and cool that we each walked away with a free, meaningful Korean souvenir. It looked like it was going to rain any second, so we wandered around looking for somewhere to have dinner. We went to this perfect bibimbap place. 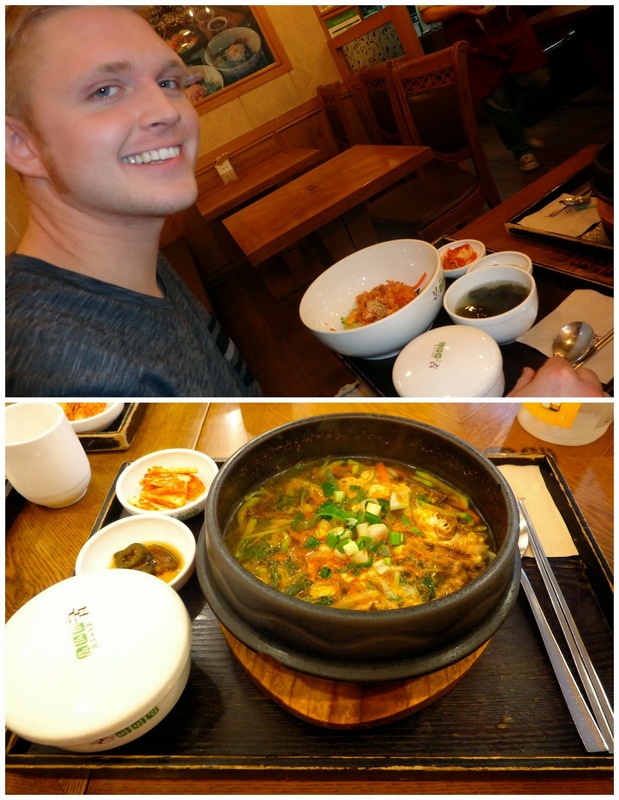 John got kimchi + beef bibimbap, while Abby and I both got the spicy beef stew. Yum yum. We got some dessert, and then parted ways a little after 8pm. When John and I got to Seoul Station we checked the TV down in the metro to see how much time before our bus would come. 21 minutes. So I used the bathroom in the metro and looked at some shops before we went up and waited by the bus stop outside. When we got outside the sign said it'd be there in 17 minutes even though we'd wasted time downstairs for at least 10 minutes. Oh well. But the sign kept saying 17 minutes for the next ten minutes, at least. It was strange. But we waited and waited. Finally it went down to 16. We waited some more. The lowest I remember it getting was 12, and then the next time our bus number flashed on the screen, the time until arrival had jumped to 43 minutes. What?! Ugg. So we waited some more. It slowly went down, minute by minute. When it got to 21 it stayed at 21 for a few extra minutes, then went up to 22. The next time our bus number appeared, time until arrival was 34 minutes. Uggg. I was so tired and cranky. It was well past nine at this point. But there was no other bus I knew of at this stop, and none that would take us all the way back to my town. We waited and I kept watching, making sure the minutes were going down. Sometimes I have had to wait an hour for this bus to come, but the screen usually reflects that and tells the correct amount of time. That night, every 15 or 20 minutes the minutes until arrival would jump up to a randomly high number. The minutes never got lower than 20 from that point on. Now it was 9:45pm! We had been outside at this bus stop for over an hour. Waiting and hoping. I'm watching the minutes tick off, I think it'll come this time. We're at 28. 27. 26. 25. 24. Okay, come on. I think we made it to 17 that time. And then the next time I looked it had jumped to 54 minutes. Some choice words may have left my mouth as I stood up and led John away from the bus platform, as it was now ten pm and this sick, tired girl wanted to sleep! We took the metro six stops, across the river to a different metro stop where we could catch a different bus to my town. I'd never done this before, as the bus from Seoul Station is faster and direct, but I thought it could work, and I was not going to wait any longer for a bus that might not come. We got on the other bus around 10:30 and were home before midnight. John was a real trooper putting up with my cranky zombie state, optimistic that we'd find a way home or could have always found a place to stay somewhere in Seoul. I'm still not sure what was up with our bus last night, but that's never happened before. Anyway, we made it back and I got my sleep. It was a cooler day today, with rain in the afternoon. 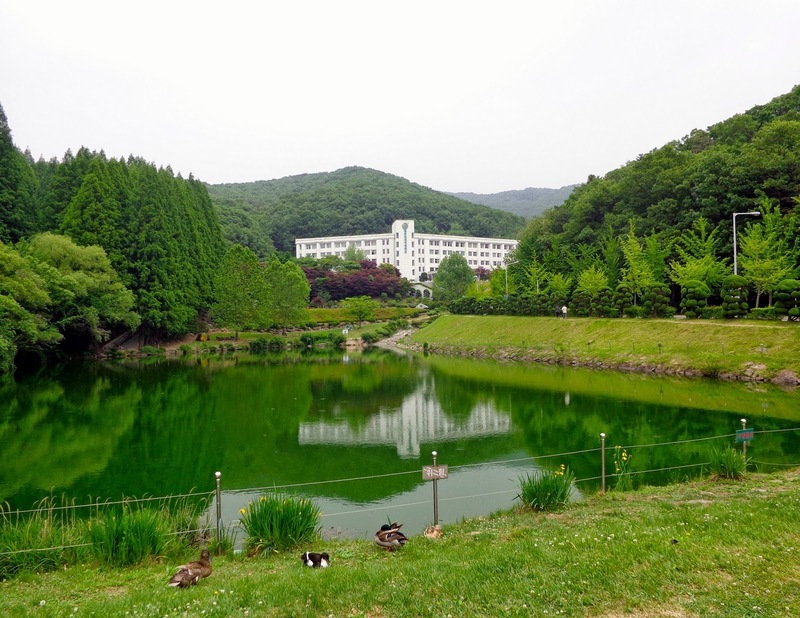 We walked around town and ran into some of my students, and after the town tour we walked up to the University - so gorgeous. 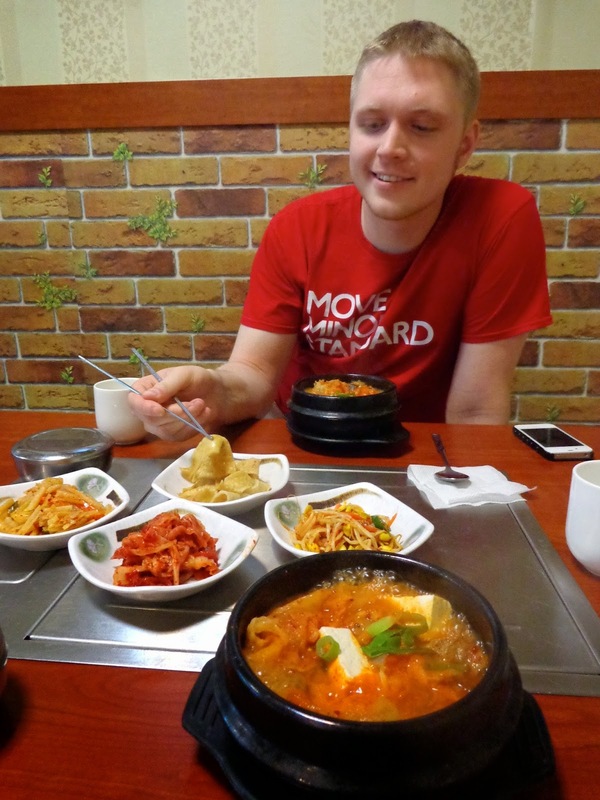 We had a late-afternoon meal of kimchi stew, a favorite of mine (John really liked it too!) and perfect for my sore throat and cold. The spice and heat opens everything right up! It was a regular Korean restaurant, so shoes came off at the door before we went in, and ate while sitting on the floor. A relaxing evening at home as it lightly rained outside, getting caught up on blogging and emails. Hope I have a voice tomorrow for teaching! It is so gorgeous up by the University -- I really should take walks up there more often.